VeggieTales doesn't require too much of a introduction because they have been around since 1993 and are well know by many. Seriously find me one person who doesn't know the VeggieTales song??? I still remember the first time I saw a VeggieTales movie (of course back then they were videos). They are very well known for their fabulous, fun, faith based movies that teach children important life lessons. 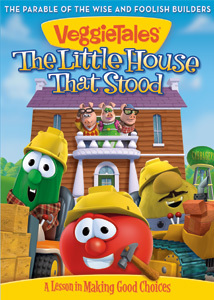 The Little House That Stood is fun, engaging and educational, just like all the other VeggieTales movies. In this DVD children will learn about two fantastic biblical parables (not pair of bulls, Silly Larry), Matthew 7:24-27 and Luke 10:27-37. The first parable children will learn about in the DVD is, "The Wise Man and The Foolish Man". The parable is retold using the fairy tale classic, "The Three Little Pigs". Children will learn the importance of building and living their lives on a strong foundation which of course is God and the Bible. They will also learn about making good choices. The second parable that children will learn about is, "The Good Samaritan." This parable is retold using several Mother Goose tales including, "Little Red Riding Hood, Humpty Dumpty, etc". Children will learn about being selfish, helping others and doing unto others as you would have them do unto you. I can tell you that my kids definitely learned something from the DVD because the next day after watching it they were in the living room building forts and talking about how they needed to have a strong foundation. It was really cute how they kept saying, "our foundation was not strong enough and that is why it fell down". I always love the subtle adult humor they sneak into the DVDs like when Bob mentions that the title Bob the Builder will never stick, lol. VeggieTales always does a great job of including valuable FREE info on their website to go along with their DVDs here are several resources you need to check out for The Little House That Stood. I really liked the movie we watched it a bunch of times. I learned about strong foundations and about being nice to others and about being a big helper. The Tooth Day song is really funny. You can order it directly off the VeggieTales website for $14.99. I also suggest visiting Amazon because many times you can get it there on sale. Fly By Promotions has graciously offered to giveaway a copy of "The Little House That Stood". Only the first entry is mandatory. Other entries are optional and give you extra chances. This giveaway is not affiliated with Facebook in any way. The winners will be posted on the blog and will be emailed. Winners must reply within 48 hrs with their contact information or another winner will be chosen. Fly By Promotions will mail out the prize to the winner. *Disclaimer of Material Connection: I received one or more of the products or services mentioned above for free in the hope that I would mention it on m blog. Regardless, I only recommend products or services I use personally and believe will be good for my readers. I am disclosing this in accordance with the Federal Trade Commission's 16 CFR, Part 255 "Guides Concerning the Use of Endorsements and Testimonials Advertising." We love them all - would be impossible to pick a favorite. Sorry! Love Veggie Tales! LarryBoy is my son's. It's a tie between Larry and Bob for me. I love the French Peas! They are always so funny! My daughter can't pick just one, but I like Bob! Larry is our favorite. And... our local Parade magazine in our Sunday paper had a coupon for $2.50 off this DVD at Walmart. We love them all, can't pick just one! Bob the Tomato is our favorite Veggietales character! Thanks!